As we welcome the return of cool, crisp days, the smell of distant campfires and the crunch of leaves under our feet, thoughts of Thanksgiving are sure to follow. It’s a time to pause and appreciate all we have in our lives with friends, family and neighbors. To join in fellowship, good conversation and good food! This is one of my favorite times of year to cook. Delicious casseroles, slow-cooker masterpieces, herb-crusted roasts, warm spices and those special family recipes that we love sharing make this the perfect holiday for those that like to cook, those that like to eat and those that love to do both! Like many, this year my wife and I will be traveling for Thanksgiving, but of course, we do not want to show up empty-handed. When deciding what to bring my first thought is to bring something that folks will talk about, something that really makes the meal. I also try to prepare something easy— we could have a long day of traveling ahead of us, so it will be important that we pace ourselves. It also needs to be something that travels well. One year when visiting home I attempted a train ride with my sure-to-be-famous deviled eggs. As you can assume, my carefully crafted plate did not fare the trip so well. With all of that being said, I have two recipes to share with you. Both these great recipes fit the bill with easy preparation that can be done ahead of time, travel well in an airtight container and are sure to start some conversations! 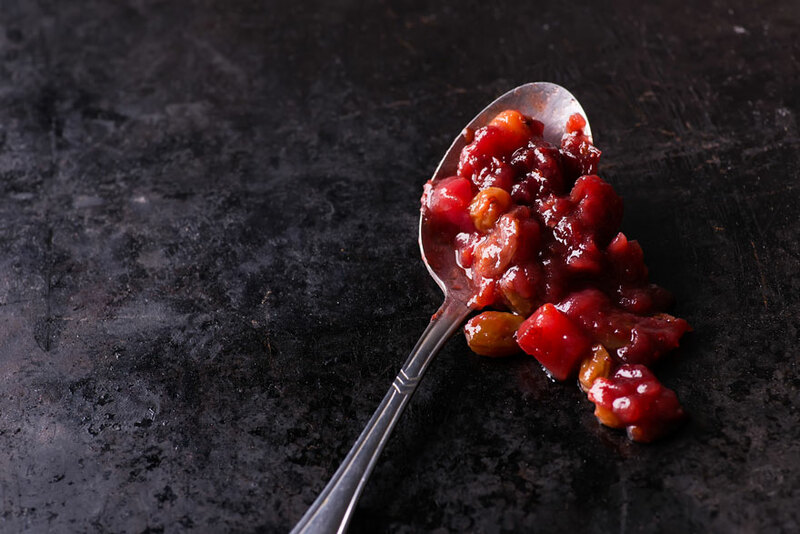 Apple-Cranberry Chutney is an excellent accompaniment to turkey, pork or chicken and can be served either warm or cold. It has a great balance or sweet and sour and boasts warm spices of the season that make it a great side dish to bring to a grand potluck dinner, a big family feast or a small dinner with friends. In a medium saucepan over medium heat, sauté chopped onions in hot oil until translucent. Add all remaining ingredients except cranberries. Bring ingredients to a boil, reduce to a light simmer and cook for 20 – 30 minutes stirring occasionally. Stir cranberries into mixture and cook 3-4 additional minutes. Chutney may be served warm or cold. Can be cooled, covered and refrigerated for 3 days. Having some good snacks available for folks while they talk and wait for the main meal is always a good idea. 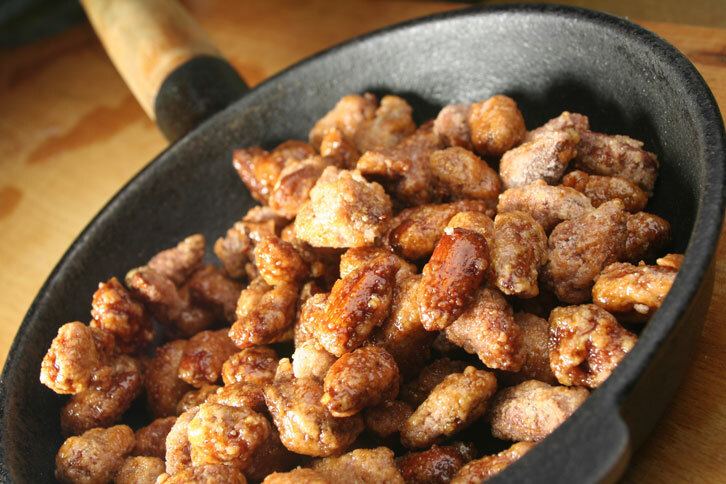 With big crunch and big flavor, these Spiced Candied Nuts are the perfect snack. Putting out a bowl of these will keep everyone’s energy up, and the sweet n’ salty flavor will definitely be talked about! Add mixed nuts to large saucepan and toast over medium-high heat while stirring occasionally. Approximately 3 to 5 minutes. Add remaining ingredients and stir while mixture comes to a simmer forming a glaze. Allow mixed nuts and glaze to cook in saucepan for about 5 minutes, stir occasionally. Transfer coated nuts to a large non-stick baking sheet.Carefully spread out and separate nuts with forks, mixture will be hot. Transfer to oven. Cook nut mixture in oven for 5-8 minutes, stir, return to oven and cook for additional 5 – 10 minutes. Glaze will be bubbly, hot and sticky. Remove from oven, stir, and cool at room temperature allowing sugar and spice glaze to harden. Once nuts have completely cooled and glazed has hardened, nuts may need to be broken apart. Serve or store in air tight container for up to 3 days. Don’t forget to give your turkey time to thaw in the refrigerator. A good rule of thumb is 24 hours for every 5 pounds. Never thaw your bird on the counter at room temperature. Never try to deep fry a frozen turkey. This can cause the oil to splatter, overflow and start a fire. Turkey fryers should also never be used indoors and always placed in an open area. Cross-contamination can happen when the same surface, such as a cutting board, hands, or utensils, come in contact with both raw and ready to eat foods. Be sure to properly wash and sanitize cutting boards, counters, knives and hands between tasks. Turkeys should be cooked to a minimum of 165 degrees Fahrenheit. Be sure to check the temperature in the thickest part of the breast, inner thigh and at the base of the wing. Juices from the meat should run clear, never pink. Be sure to refrigerate leftovers as soon as possible, always within 2 hours, and spread out in shallow pans to speed up the cooling process. Cut turkeys and other roasts down into smaller pieces and remove any stuffing to cool separately. If traveling with prepared food, it is a good idea to keep hot foods hot in a thermal bag and use coolers, thermal bags, ice and ice packs to transport cold foods. Keep those hands clean, washing with warm soapy water for a minimum of 20 seconds is key. As the season grows closer, we continue to think of all the things we are grateful for in our lives. Take these recipes and share them with your friends and family! Comment your favorite Thanksgiving recipes down below and let us know if you try either of these! 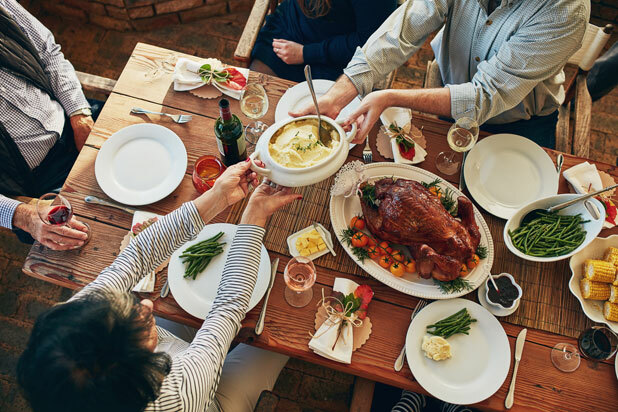 Download your easy Thanksgiving recipes below! Danial Smith is the Director of Dining Services at Carroll Village where he operates the Marketplace Café for Presbyterian Senior Living. As a part of the Cura Hospitality management team, he opened the Marketplace Café seven years ago. He is a proud alumni of the Culinary Institute of America, class of 97. He and his wife, who is also his high school sweetheart, are originally from Philadelphia and currently live outside of Gettysburg, PA.